MDPhD is designed for quick consumption of evidence. 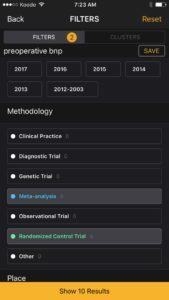 It helps users look at the big picture and identify clinically reproducible results or trends over the years. 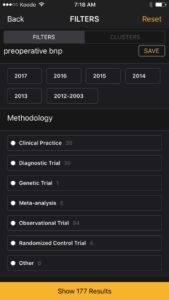 As you explore MDPhD, you will also quickly realize there is a huge delay (sometimes over 10 years ) in translating research from the benchside to the bedside. This maybe due to several barriers like information overload, cost of articles, lack of time, or awaiting endorsement by guidelines or experts. MDPhD strives to solve each of these barriers so you can help your patients today and not 10 years from now. Go to the ‘Home’ tab and type in your query. You will have to experiment with different queries. This particular query yielded 177 results. 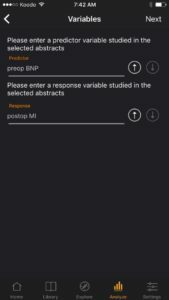 You could also try a more general query like “bnp” and apply clinical filters like ‘Date’, and ‘Speciality’ to drill down your results. More on filters in Step 4. In general, type queries and tap filters to start the discovery phase. Browse the results quickly. The results you see are evidence based medicine summaries of clinical abstracts or ‘MDPhD cards’. The results are ranked by relevance. The cards are colour coded by methodology. For example, “Clinical Practice” which is generally a review or guideline is pink while a “Meta-Analysis” is blue. Statistical results of the study are displayed using a data visualization to highlight the value of the point estimate and the confidence interval so the user can appreciate the statistical significance and the clinical significance of the result (please see cartoon ebm tutorials on this site or in the Settings tab in the app for a quick primer on EBM). Create a folder in the ‘Library’ tab. Tap the plus button top right in the Library tab and name your folder. 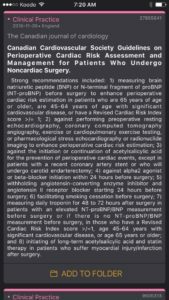 For example “BNP” or “Cardiac Risk”. 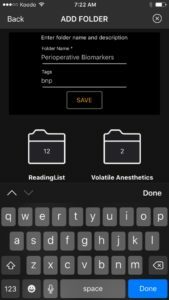 You can also add descriptive tags to your folder like “anesthesia”, “periop”, “biomarkers”, “bnp”, “troponin” etc. Start populating your folder with relevant cards by tapping “Add to Folder”. There is also a default “Reading List” folder where you can dump your cards quickly. You can always organize your cards into folders later. More on Filters. 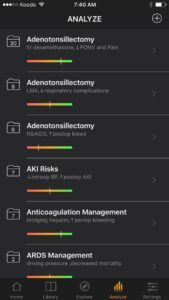 Most often it is better to start with a general query and drill down your results with our clinical ‘Filters’. Tap the filter icon (top right Home tab) and you will immediately appreciate the distribution of results of your query. 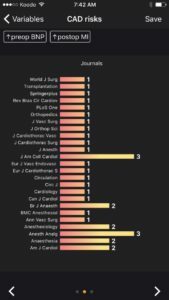 For example “preoperative bnp” is heavily weighted with ‘Observational Trials” and most studies are coming from “North America”. I often start with “Clinical Practice” and “2017” to get an updated intro on the topic. As I learn about the topic I refine my queries and start exploring. Then I will generally check out the “Meta-Analysis” and “Randomized Control Trial” filters. 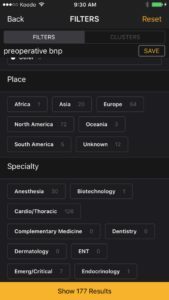 I will also check “Specialty” filters to get more relevant cards in my field. While you explore, continue to add cards to your folder. Review your results. The whole “Search-Filter-Add to Folder” workflow should take minutes. You don’t have to go overboard to appreciate the historical trends and relevant clinical outcomes of your query. 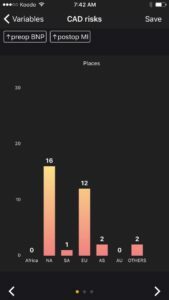 To help you look at the big picture, tap on your folder and tap on the ‘Charts’ button (top right) and check out the data visualizations. 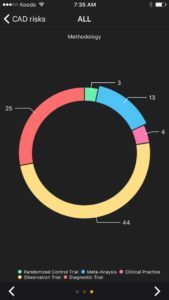 You will quickly see where the research is coming from, what journals it was published in and the distribution of research methodologies. 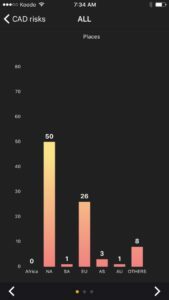 The charts are interactive so tap on a bar or a slice! Your EBM folders can be updated and reviewed anytime. Synthesize your results. As you start populating your folders you will notice trends in clinical outcomes. 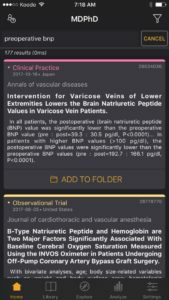 For example, after populating my folder, “CAD Risks”, I quickly notice that there is over 10 years of research and several guidelines showing the prognostic value of preoperative bnp in various clinical settings with various clinical outcomes. All you need to do is look for clinically significant patterns in your folders. No need for complex mathematical models just a narrative review based on your clinical experience, expert opinion, biological mechanisms, and trial data. Go to the “Synthesize” tab, select your folder and select the cards which you want to synthesize. Then enter what you think is the primary predictor variable (i.e. 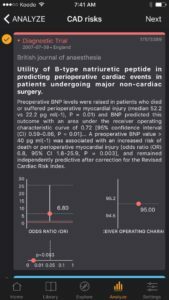 “preop bnp”) and what you think is the primary response variable (i.e. “post MI”). 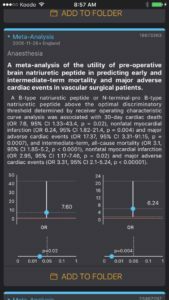 Other response variables were also studied in my folder like postop mortality, atrial fibrillation and MACE (major adverse cardiac events). 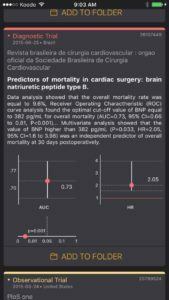 You can link multiple analytics to your folders with unique predictor-response relationships (like ‘preop bnp-postop mortality’, ‘preop bnp-postop MACE’ etc). The important point is to look for patterns of reproducible and clinically significant results over several studies rather than analysis-paralysis of a single study. Several interactive graphs will help you visualize your synthesis. 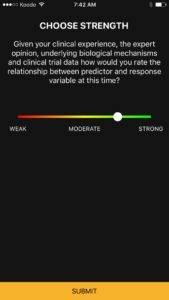 Finally you are asked to rate the strength of the predictor-response relationship based on your experience, expertise, trial data and biological basis. 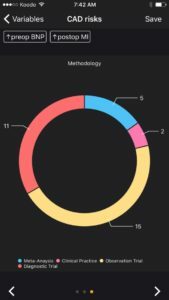 This can be updated anytime with new evidence. Strong relationships today can become weak relationships tomorrow and vice versa. 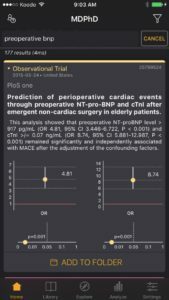 I rated the evidence on the ‘preop bnp and postop MI’ relationship as close to strong at this time. The only weakness I could identify was a paucity of RCTs on the topic right now. 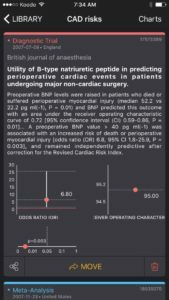 However, I can see enough of a signal in the research to incorporate preoperative bnp into my own practice while not seeing any real downside. The syntheses you create are linked to your folders. There is a chart icon in a folder that gets updated everytime a new synthesis gets linked to the folder. You will notice 2 syntheses in my ‘CAD risks’ folder right now. After researching preop bnp I also synthesized some studies on postop troponin monitoring. I am hoping that adding perioperative biomarkers to my practice will make a difference. This is the workflow in MDPhD. 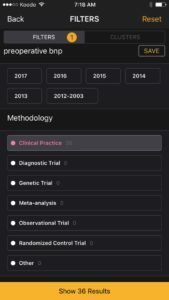 The idea is to make evidence based medicine easy and quick to consume, to help identify reproducible patterns in clinical research and help transfer that knowledge to the bedside to benefit patients today. Clinical decision making should always incorporate patient values and resources. Just an aside about the Explore button. Everytime you create a folder it is available for other users to add into there following list in the Library tab. 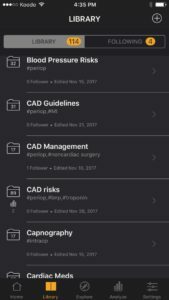 So if you are interested in perioperaive biomarkers feel free to follow my ‘CAD risks’ folder by searching it in the “Explore” tab. You can also search by username like @singwis or by hashtags like #bnp. 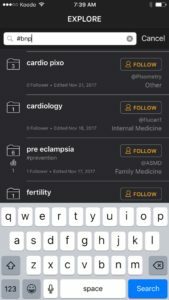 As users start adding folders to the network other users can follow and participate in the collaborative network of MDPhDs. .